When you buy 15 Kraft Mac & Cheese Dinners between now and 10/10/12 you will get $5 back. This is a super way to get double savings! Stack sales and this $5 deal for a double discount. These can be bought anytime over the next weeks, they do NOT need to be purchased in one transaction. Get the Save $5.00 when you purchase 15 boxes of Kraft Macaroni & Cheese Dinner. Offer includes: 7.25 oz, 5.5 oz. size. Expires 10/10/2012. Click the “I Want It Button” to get activate the savings. Then when you buy the Kraft Mac & Cheese items using your loyalty card the savings will start. 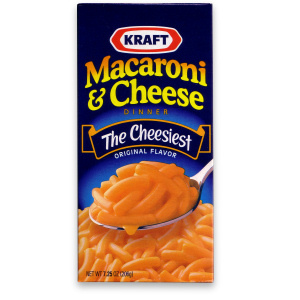 Save $5.00 when you purchase 15 boxes of Kraft® Macaroni & Cheese Dinner. Offer includes: 7.25 oz, 5.5 oz. size..
Have you signed up for SavingStar yet? If not, it’s another great way to save money on groceries and household products. Unlike typical e-coupon sites, when you use SavingStar coupons the amount of the coupon is deposited into your SavingStar account. After you sign up, link your store cards, and clip the coupons. After the money is added to your account, you can redeem it for gift cards or cash. An amazing coupon just came up on the Kraft Macaroni & Cheese Facebook page! To get the Kraft Mac & Cheese Coupon, go to the Kraft facebook page. Like them, and click on the “License to Skim” tab to print a coupon for Buy 1 Get 1 Free Macaroni & Cheese 7.25 oz coupon. It will most likely go very fast, so print it while you still can! Rare!! Get the Kraft Mac & Cheese Coupon- print 2 but before printing click help so you can request one by mail too!! That’s 3 Kraft Mac & Cheese BOGO coupons! !